« Autumn Weight Loss- Life gets in the way! I am smack in the middle of an Autumn weight loss routine, AND, going on holiday. However this need not be a great crisis or even the best excuse to ditch the whole effort. Question: How can I and how can you keep some modicum of weight loss success continuing, when we go on holiday? Do not go down the path into martyrdom. It does not win you friends. No grumpy face; it’s not fair to spoil other family member’s fun. Be Mindful and make reasonable food choices when possible. Have an established routine before you go away on holiday. Keep Momentum; be thrilled with your past success. When you return DO NOT go on the scales for one week! (negative energy saps resolve). Self-Sabotage waits to slap you about and it deflates confidence. Self-sabotage works on self-taught messages stored in the subconscious; it’s as if you just can’t help yourself from going adrift. An additional help to success is of course: A doze of The Shits. In my case on Day 3. I believe it was a result of our Booking Company’s hotel arrangements being very badly managed; we are now seeking compensation. 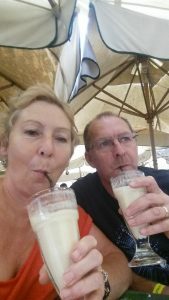 How did I manage weight loss and a healthier living routine when in Malta? I managed pretty well actually. I am blogging about my Weight Loss journey to help me keep accountable. I need to address my eating and drinking habits. Neither are way out of kilter but my life long general food and drink choices give me no room to lose pounds in weight. I know what to do and at the moment I am following a regime which appeals. I had a few moments on holiday last week when I wondered if it would all go to Hell. It didn’t. BTW-Joe Wicks ‘Lean in 15′ is a great book. I do wish I had written that! I did my best. I was already in a habit of making good food choices and feeling healthier as a result. This was Key to my success. I was brave enough to go on the scales the morning after my return. I suggest that you do not do this!! I did it with a slight sense of dread and was THRILLED with what I read: one pound gain. For those following my Blogs that means that in the few weeks since starting my healthier eating and more strenuous exercise routine, having a birthday holiday break with 2 days away AND a week in Malta, I have still lost 4 to 5 pounds in that time. I am very pleased with that. It’s realistic. 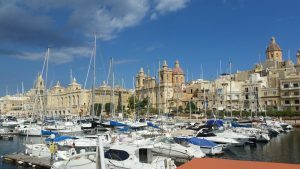 What helped me keep on track with weight loss when away in Malta? I repeat; I did my best without blowing it (and me) out of all proportion. I was on holiday and had worked blooming hard to have this little treat! I suffered a huge amount of stress because the Hotel booking was hopelessly wrong and we’re going to deal with the chaos now we’re back. I did drink alcohol when away but managed to make very good food choices (after Day 3 once my digestive system quietened down). What naught things did I get up to? We ate at a variety of restaurants and enjoyed great food. We ate late and alcohol was consumed but I didn’t actually want to drink loads as it does seem to affect my sleep. Look at this gorgeous plate of food! 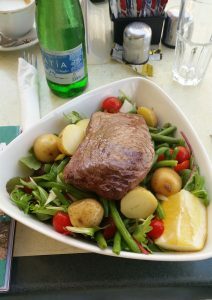 This is what I call a Salade Nicoise served to me at The Caffe Cordina in Valetta, an old haunt of Herb’s family when they lived in Malta. Be Mindful when exercising new weight loss habits! Don’t waste your time and energy on a project which needs self-discipline and some hard work. 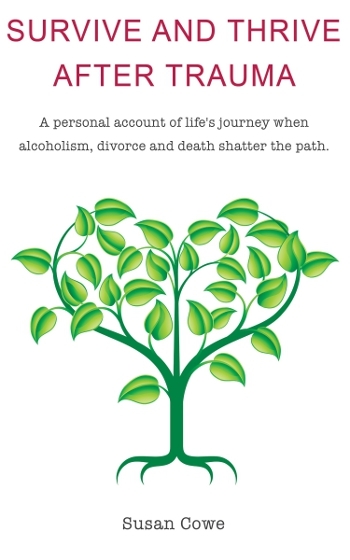 Only begin when you have given thought, done the planning and feel almost exhilarated at the thought of Feeling Better. Without question I feel better and so can you. Success breeds success; confidence grows. (I loved my indulgances over the years and have addressed some- but not without hard work, dedication and a subconscious respect for my body- I knew work needed done. I have stopped smoking about 10 years ago. ). Do you believe that you can feel better if you succeed in your plan? Do you dread failure, the same negative result- the ‘I’m not good enough’ sensation, it’s just too difficult? I am an Emotional Healing therapist working holistically to help clients feel better and move on from Stress and Trauma. Check out my EFT Tapping video. This can help you when self-doubt creeps in. More on my Youtube channel; some are suitable for you as support when stress or anxiety leads to overwhelm and some are to help others with deep anxiety, anger or fear. I can also be found at Susan Cowe Reiki.